Tyler and Amy Fisk of Cookeville, Tennessee offer a large selection of flask designs. You may wonder, like myself, the quality of the adhesive added...but do not fret. As they explain, "We have spent over a year and a half tweaking and improving the design process. We design the patterns in Photoshop, print them on high quality vinyl and adhere the designs to the flasks with a solvent based permanent adhesive." Adding, "No other Etsy sellers can compare to the quality of our flasks." 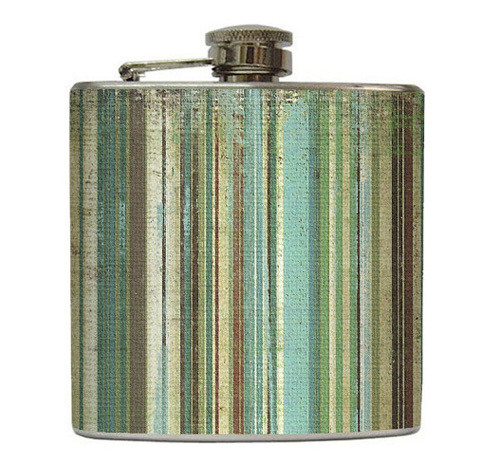 88 Flasks have been designed specifically for the men. I love the mustaches...but also some of the backdrops that have a worn, vintage feel. As Tyler shared with me, "Our flasks bring a modern flair to an old school accessory." Many flask designs are inspired by the Southern farms Amy and Tyler grew up on and around- as well as the beaches of the Carolinas and Florida. When I asked Tyler why a man should carry a fashionable flask, he responded, "It brings out that old school, bad boy swagger. They're fun to carry and it is definitely a conversation starter." All flasks are available in a 6 or 8 oz size and besides the opportunity to personalize your flask with your name, initials or a picture, you can also custom design your very own. This is my favorite type of gift as you can make it unique and unexpected.